While it’s true that there is just no end of seasonal pumpkin stuff going around right now (if you go to Trader Joe’s, their ingenuity in cranking out pumpkin-labeled products is starting to approach, um, sufficiently-advanced-as-to-be-indistinguishable-from-parody status), on the other hand, my son Sam in particular just can’t get enough pumpkin, and it’s one of the few “traditional Thanksgiving foods” that I actually like, so, more for us! I made this platter of pumpkin cookies with white-chocolate chips and pecans on Halloween, and was giving them out to trick-or-treaters along with the candy (and along with eating plenty of both the cookies and the candy ourselves as well, of course — the recipe made about four and a half dozen cookies, but a lot of them were getting eaten before they could even make it onto the platter). 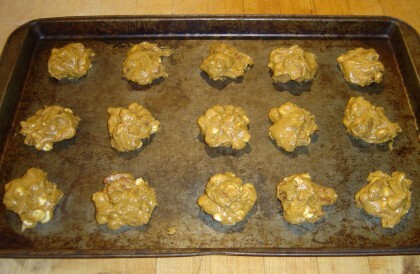 I had adapted this recipe from the Maida Heatter’s Cookies cookbook’s “Pumpkin Rocks” recipe when baking for Summer Games Group some months back. “Many old cookie recipes are called ‘rocks,’ not because they’re hard as rocks, but because of their shape,” explains Maida, and I will elaborate further that these cookies are not rocklike to the point of being big and soft like muffin tops, rather than chewy or crisp. While in general I have “Always double the spices!” as a strong rule to live by, with this recipe I quadrupled the cinnamon, ginger, cloves, and allspice, because they seemed like such token amounts compared to the strong, spicy flavor I would want for this sort of cookies. I left the nutmeg amount as written, though. I used salted butter instead of unsalted, because I just never bother with unsalted butter. Instead of using a pound of pumpkin, I used fifteen ounces, because that’s the standard size for a can of pureed pumpkin around here. I left out the raisins because they’re one of the few kinds of dried fruits I don’t care for, and because I wasn’t looking for that kind of texture in the cookies anyway. I used eight ounces of pecans instead of seven ounces of walnuts, because I was more in the mood for pecans, and because I had an eight-ounce bag of pecans. 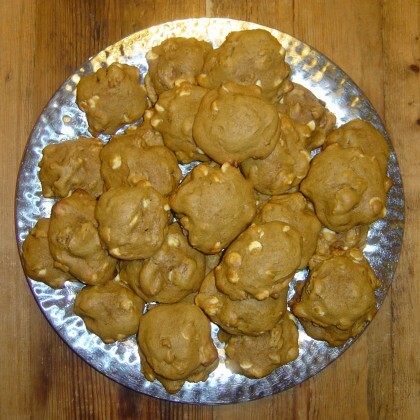 And while I usually have an “Always double the nuts!” rule as well, with the amount of cookie dough this recipe makes, eight ounces is just fine. I mixed in a bag of white-chocolate chips instead of frosting the cookies with white frosting. I think that almost all baked goods taste just unbelievably better right out of the oven than they do some hours or days later, so if I’m making cookies for an event, in general I want to bake them either right there at the event, or immediately before I leave for the event, so I can just take them out of the oven and run out the door. This policy is incompatible with frosting — having to let the cookies cool before you can frost them, and then having to wait quite a while for the frosting to set so you can stack the cookies on a platter or in a container without them all fusing together — so with rare exceptions I don’t do frosting with cookies. But white-chocolate chips make a good still-gooey-but- not-messy internal substitute, and I had had the pumpkin-white-chocolate combination before at bakeries. Cream together the butter, sugar, brown sugar, salt, cinnamon, ginger, cloves, allspice, and nutmeg, in a large mixer bowl or other large bowl. Mix in the two eggs, one egg at a time. Mix in the can of pureed pumpkin. Measure the flour, baking powder, and baking soda into the bowl, and mix them all in together. 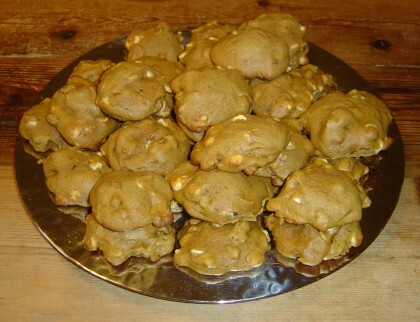 Mix in the pecans and white-chocolate chips. Each cookie should use about two tablespoons of dough, and use a spoon to scoop and drop them onto the cookie sheet (this dough/batter is way way too sticky and gooey to roll into balls). Bake in a preheated 375° oven for about 14 minutes, until done. Makes 4 to 5 dozen cookies.